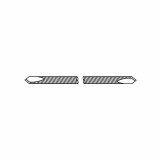 Below are a few of our most popular cerclage wires, k-wire (Kirschner wire), and stein (Steinmann) pins for use in hand surgical procedures. We can reference any catalog number from any company. If you don't see the pin or wire you are looking for, contact us.